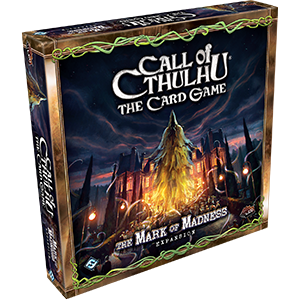 "There is a whole secret cult of evil men (a man of your mystical erudition will understand me when I link them with Hastur and the Yellow Sign)…"
The Mark of Madness is the tenth deluxe expansion for Call of Cthulhu: The Card Game, introducing 165 new cards (three copies each of 55 different cards) that explore those depths of insanity that lie near the core of the Lovecraftian mythos. Devoted primarily to the Hastur faction, The Mark of Madness introduces a great number of deranged Artists, Cultists, and Lunatics, as well as the terrible, ancient powers that spur them forward. As Hastur's secret cult expands its powers, you'll also find a maddening array of new characters, support cards, conspiracies, and events, most of which lend new strength to the game's Terror struggle and mechanics for insanity. Additionally, as Hastur's madness reaches outward to all of the game's eight factions, each gains a powerful new character that enters play insane and reshapes the game when it is restored. It's unknown whether or not these new characters will be able to prevent Hastur's followers from plunging the world into a new age of terror and chaos, but they gain additional support from other characters, events, and support cards.